A Moroccan themed dinner tonight.This was easy and very satisfying. 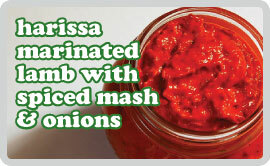 The marinade contains harissa, a paste made from chillies which originates from Tunisian cuisine but also widely used in Morocco and Algeria. You can buy shop bought Harissa pretty easily these days. The whole dish has a bit of a kick which, in my opinion, is good any night of the week. This serves 2. Combine all the marinade ingredients and coat the lamb chops in it. Leave in a covered bowl, in the fridge for 1 1/2 hours or overnight. To cook, remove from marinade, season with salt & pepper and depending on the thickness of the meat, place under hot grill for 7-8 minutes per side until slightly crispy on the outside but pink and juicy inside. Boil the potatoes and the parsnips in separate pans until tender, then drain. Mash the potatoes then puree the parsnips with the cream. In another pan, heat the butter until it bubbles. Add the spices and stir for about 20 seconds. Now add the potatoes and the parsnips and stir in well to combine everything. Add the milk and stir again. Remove from the heat, add salt to your taste and put the lid on. Heat a knob of butter and a small drizzle of olive oil in a pan over a medium heat until melted. Add the onions and fry for 5 minutes until golden. Turn up the heat to high and let some of the onions crispen. Reduce heat again and add the cinnamon, harissa, a squeeze of lemon juice and coriander and stir in well for about a minute. Remove from heat. 2 pieces of lamb with some mash on the side with the onions sprinkled over the mash.